Camping, like many YMCA programs, is about learning skills, developing character and making friends. But few environments are as special as camp, where kids become a community as they learn both how to be more independent and how to contribute to a group as they engage in physical, social and educational activities. Camping teaches self-reliance, a love for nature and the outdoors, and the development of attitudes and practices that build character and leadership—all amidst the fun of camp fires, bugle calls, canoeing, archery, talent shows, and meaningful relationships. Counselors are dedicated to making sure camp is an amazing experience for every camper. As a year round facility Camp Jewell offers a range of different positions regardless of the season. Employment is divided into two categories: Summer Camp, and Outdoor Center (fall, winter, spring). If you have not worked at Camp Jewell before, please check out our vacancies to see what positions we currently have available. If you are a returning staff member, please complete our returning staff application. Cabin counselors live with a fellow staff member and 8-9 campers of similar age. Counselors act as role models, teachers, best friends, parents, nature guides, entertainers, and inspirations to their campers. The position requires maturity, creativity, and a strong commitment to the YMCA mission. Counselors have the freedom to initiate activities for their specific groups each afternoon. All counselors must have graduated from the Camp Jewell CIT program or have completed their first year of college. Program counselors live in camper cabins and perform several of the same tasks as cabin counselors, but their primary responsibility is to lead and organize a program clinic area. Solid skills and teaching expertise is required to be a program counselor. Certifications are required for some program areas such as lifeguards, boating, archery, etc. Leaders in the adventure trips program are responsible for overseeing 2-week long backpacking hikes, bike tours, rock climbing programs, sea kayaking, and whitewater trips and sailing experiences throughout the United States. The leaders must have excellent organizational skills, strong leadership abilities, and technical expertise. Trips are coed groups of 10-12 campers, ages 13-16, each staffed by male and female co-leaders. Leaders must be a minimum of 21 years old and will be required to pass life-guarding, wilderness first aid and professional CPR courses included in camp’s staff training. 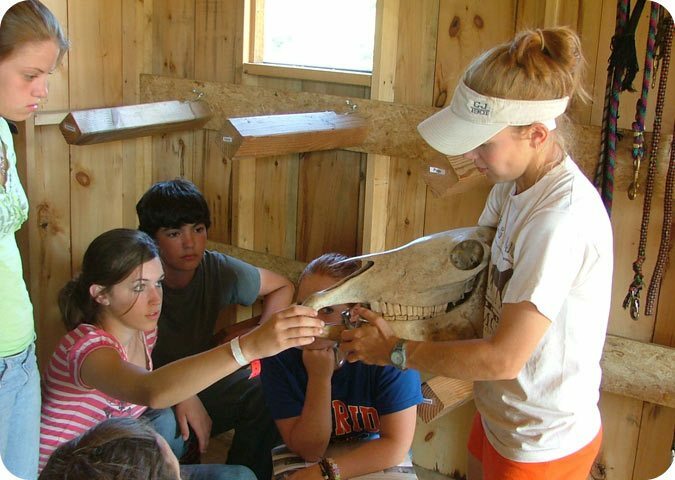 Leaders in the ranch program are responsible for 8-9 campers in their cabin, ages 7-15. The staff’s most essential responsibilities include maintaining the physical and emotional safety of campers, developing positive lasting relationships with youth, and providing quality safe educational opportunities for kids to bond and relate with their animals. Ranch Counselors teach and/or assist group lessons on a daily basis with 7-8 riders of like ability. A riding instructor can log as many as 180 instructional hours of teaching in a summer; with additional time spent feeding, grooming, tacking, and providing equine first aid. The Ranch Staff’s responsibilities include non-horse related activities as well. Waterfront, high ropes, sports, campfires, and nature exploration are just some examples of the activities staff facilitate for campers. Camp Jewell is organized into villages by age group. Each village consists of cabins totaling 30 to 60 campers and 8 to 12 staff. Village coordinators supervise staff, organize many of the activities for the village, and provide much of the daily leadership in camp. Coordinators are also sought for major program areas such as waterfront, riding, arts and crafts, sports, nature, and ropes courses. These members of the camp’s administration team are usually college graduates and are housed in cabins within their assigned villages. Previous resident camp experience is required. There are several opportunities for staff members to work in either the trading post, office, maintenance department or the kitchen. Generally, interested staff need to have a minimum amount of experience in their area of interest. Each summer camp employs at least three Registered Nurses to operate our 14-bed health center. Primary responsibilities include medication distribution, emergency services and preserving the overall health of Camp Jewell. Nurses enjoy a private living area attached to the health center that includes a kitchen, dining room, bathroom, and washer and dryer. Salary is based upon position, experience, years at camp, certifications, and other factors. All staff are required to attend comprehensive staff training before summer starts. Staff will receive comprehensive training in behavior management, supervision, program organization, child abuse prevention, first aid and CPR. All staff are required to wear a uniform that includes a staff shirt (provided), khaki pants or shorts, belt and shoes that have a back strap (no flip flops are permitted). To apply, please complete the on-line application form. For additional information, please contact Craig Dawson, Associate Executive Director, at 1-888-412-2267 or craig.dawson@ghymca.org. International staff must first submit an application and obtain a working visa through a qualifying sponsorship organization such as the Camp Leaders, Camp Counselors USA (CCUSA), or Camp America. Only returning staff may apply directly through Camp Jewell. For additional information or assistance from Camp Jewell YMCA, please contact us at camp.jewell@ghymca.org. 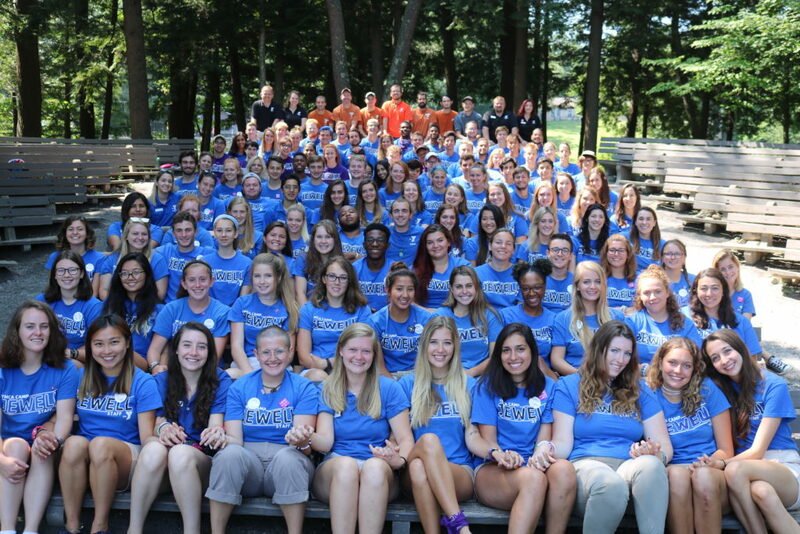 Camp Jewell hosts over 20,000 visitors each year who enjoy our beautiful 540 acres, friendly staff, and innovative programming through our Outdoor Center programs. The three primary program areas are; teambuilding, outdoor education, and conference/retreat. Outdoor center staff are trained to work interchangeably within all three programs. Cleaning cabins and facilities is expected in all program areas. Staff who work in teambuilding typically host a group of 8-12 participants on the high and low ropes course. Group type and ages vary widely, although most groups are from schools and universities. Teambuilding is especially busy during both mid-week and weekends in September, October, March, April, and May. Staff in our outdoor education are trained to work with elementary and middle school students in a variety of science based activities. Although a few outdoor education groups come in the fall, the majority visit in the spring. The conference and retreat program is the largest and most diverse of the outdoor center programs and has the longest season. Staff can expect to host and lead activities in various summer and winter type sports, arts & crafts, and indoor activities. The conference and retreat program is busiest on weekends in the winter and early spring. There is no typical day or week at Camp Jewell. Staff working hours revolve around the needs of each individual group. Staff average between 30 and 40 hours per week. Outdoor Center staff enjoy many benefits, including free room, board, and utilities, as well as meals and access to camp activities and supplies. Staff are housed in comfortable dorm-like quarters with cable in each room, and share a room with a fellow staff member. All staff share a common living room, equipped with cable television, telephone, and wireless internet access. Staff also have access to a community kitchen and on-site washers and dryers. The most important benefit, however, is the close friendships amongst staff that develop throughout the season. To apply, complete our online staff application.